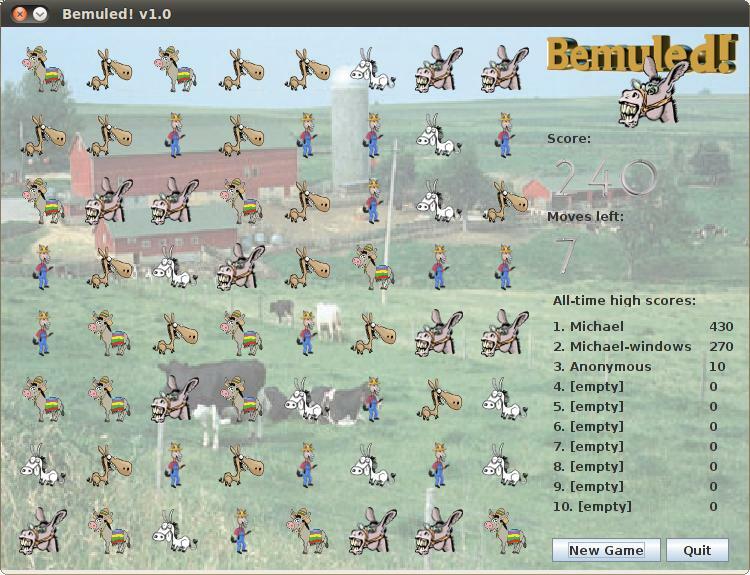 Bemuled! is a game similar to the popular game Bejeweled. The goal is to generate runs of three or more identical cells in an eight by eight cell board. This is done by swapping two adjacent cells. The more runs you create, the more points you get. Bemuled! changes the rules slightly by limiting the player to only ten moves. Because of this, you must carefully analyze each move you make in order to get the maximum number of points possible. If your score is high enough, you can add your name to the high score list. This list resides on the Internet, so you are competing with players around the world! I also wrote a technical overview, which documents things like what libraries are used, some of the technical problems that I ran into, and how certain components are designed. Click on the donkey to play!